When patients suffer from severe instability of the spine, for example an advanced stage of slipped vertebrae, or when no improvement can be expected from conservative treatment, surgical intervention may be considered. Fusion surgery (spondylodesis) may even be useful in some cases of scoliosis or spinal injury. 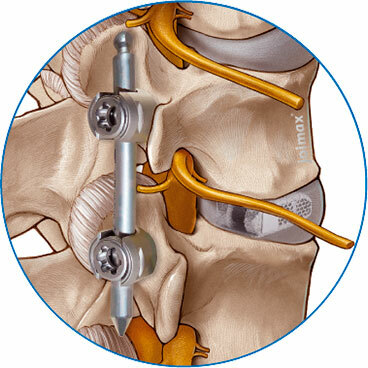 Worn discs are the most common reason for spinal fusion surgery. The stiffening operation – called fusion or spondylodesis – is one way of alleviating pain and improving the patient’s quality of life so daily activities can begin again. The intervention aims to connect two adjacent vertebrae. Pain triggered by movement in this section can be prevented by fusion surgery. First, the intervertebral disc between the affected vertebrae is completely removed. The empty intervertebral disc space is then re-filled to regain as far as possible the natural spacing of the vertebrae, and thus the natural anatomy of the spine. The filling material should be sufficiently stable to stimulate bone growth, and also in the long run be well tolerated. One way is to remove a piece of bone from another body location – often the iliac crest – and use it to replace the intervertebral disc. While this approach shows good results for the fusion of the vertebrae, it often leads to severe complications at the harvesting site. Patients frequently complain for a long time after surgery of pain in this area. An excellent alternative offer “cages” – which are biocompatible spacers. They provide sufficient stability and are well tolerated. Cages are inserted into the empty disc space together with loose bone chips, which are a feature of the operation, or artificial substance mixtures that stimulate bone growth. There are clinical studies demonstrating very good results for the cage technique1. In other words, cages are just as effective as a piece of natural bone, and offer the advantage that bone does not have to be removed. For the patient, this means a far shorter operation time, and no risk of complications or pain at the harvesting site. joimax® has a range of cages for the lumbar spine. The decision on which implant is the best for you, is in the experienced hands of your surgeon. 1. Aaron R Cutler u. a., „Comparison of polyetheretherketone cages with femoral cortical bone allograft as a single-piece interbody spacer in transforaminal lumbar interbody fusion“, Journal of Neurosurgery. Spine 5, Nr. 6 (Dezember 2006): 534-539.